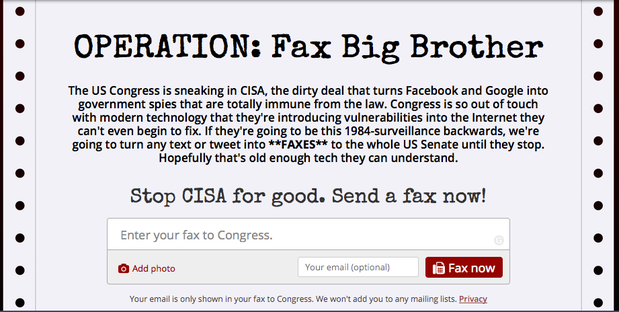 Digital rights group Fight for the Future launched an old-school fax campaign opposing CISA, a cyberthreat sharing bill. The Information Technology Industry Council (ITI), a tech trade group, called on the Senate to bring CISA up for a vote, but suggested the bill could be further refined. Senators are hearing from constituents opposed to the bill. An old-school fax campaign, launched earlier this week by digital rights group Fight for the Future, generated more than 6.1 million faxes to senators from constituents opposed to CISA, the group said. CISA "funnels information to the government, private personal data from businesses to the intelligence community," Mayer said during a press briefing Thursday. In addition, the NSA, using its surveillance authority, can use the data to target the people whose information is shared, he said. Lawmakers are under "a lot of pressure to have some kind of response" to cyberattacks after a massive breach at the U.S. Office of Personnel Management (OPM) was announced in June, Wyden said.